Do you yearn to get fitter but don't know where to start? Well running is the perfect way in which to start. All you need to get started area good pair of trainers and some running clothes. There is no monthly gym membership to pay out for so it makes running not only good for your health but also good for the bank balance too. Anyone can start running, even if all you can manage to start with is a light jog around the block then you are on your way to a healthier and fitter life. This guide is all about getting out there and getting started and taking back control of your health. 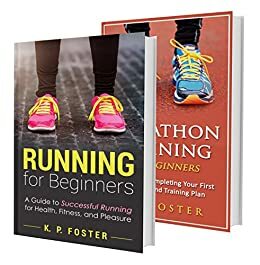 So if you have come here looking for advice and tips on getting started running as a beginner then you have come to the right place. Download this guide now and remember its free when downloaded with Kindle Unlimited!! Many runners dream about completing a marathon. Its the pinnacle of any runners ambition to run those 42.195km. Many runners never realize those dreams but with this guide you can give yourself a fighting chance of running's ultimate endurance test. Even if you don't want to complete a marathon this book is packed full of handy hints and tips to take your running to another level. Running is inclusive and affordable. Of all the sporting challenges running a marathon is the most attainable to the average person at home. People from all walks of life complete marathons every year. This said its still an exclusive club to join when a marathon is actually completed due to the mental and physical demands placed on oneself in order to finish the race. This is where this book comes in. Give yourself the best chance of success and download this guide now! Secrets of Better Skiing: Ski Tips Guaranteed to Help Your Ski Technique!